"He would have been more successful in mathematics if he had been less so at cricket," is what Whitehead's maths teacher wrote about him on his graduation from Eton. Once at Oxford, to which he'd nevertheless gained entry, Whitehead's distraction diversified to include squash, tennis, boxing and poker, at which he reportedly staked large sums of money. Worse, Whitehead did not even seem to want to become a mathematician at first, instead he joined a stockbrokers firm in London on completion of his degree. But luckily, all turned out well for maths in the end. Working in the City wasn't to Whitehead's taste, and after a detour to Oxford he enrolled for a PhD at Princeton in the US. Here he began to work on two areas which benefitted greatly from his contributions: topology and differential geometry. Both differential geometry and topology deal with surfaces like the sphere or the torus, or their higher dimensional analogues. While differential geometry looks at rigid properties that depend on a metric, for example the curvature of a surface, in topology metric properties are irrelevant. Topologists regard two objects as being the same if you can deform one into the other without tearing. The famous example is that a coffee cup and a doughnut are topologically the same. Whitehead contributed two major works to differential geometry, now considered classics. In topology he is best remembered for his work on "homotopy equivalence", a central notion when it comes to pinning down whether two objects are topologically equivalent. Notably, Whitehead spent quite some time working on the now famous Poincare conjecture and even thought that he had found a proof. However, an inconspicuous pair of interlinked circles, now known as the "Whitehead link", gave rise to a structure that Whitehead had assumed not to exist. This toppled his proof and the Poincare conjecture was to remain open for another 70 years. Whitehead also contributed to maths in another, less theoretical way. The percecution of Jews in Nazi Germany troubled him greatly, and he helped a number of eminent mathematicians to escape, including Erwin Schroedinger, one of the founders of quantum mechanics. Had Whitehead not died suddenly of a heart attack at only 56, he certainly would have gone on to contribute even more. and see a picture of the Whitehead link on Wikipedia. Scientists are currently building the largest machine in the world in order to understand the smallest fragments of our universe. Their insights will throw light on some of the biggest questions there are - how did the universe start, what is it made of, and how will it end? The machine is the Large Hadron Collider (LHC) and it is buried up to 175m below ground in a huge circular tunnel close to Geneva. To prepare for its inauguration at the end of this year, the Science Museum has put on a special exhibition entitled "Big Bang". The accompanying website tells you all you need to know about the collider and the science behind it. It's accessible for everyone from school age onwards, no previous knowledge required. 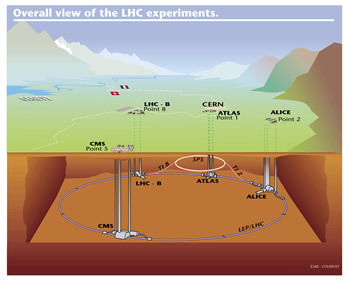 You can also read about LHC in the Plus article, Secrets of the universe. In the Imaging maths series Plus explored how to visualise, transform and unfold strange geometric objects like the Klein bottle or the Möbius strip. Now Plus has come across a British artist who does just that, but without the aid of computers. John Pickering bases his work on one simple mathematical transformation, the inversion in a circle. His works are beautifully intricate 3D objects made up of 2D slices, with each slice and its relationship to the others worked out using honest and rigorous co-ordinate geometry. Unfortunately, Pickering's work can't be seen on the web, so if you're interested in mathematical art, keep an eye out for one of his exhibitions. Alternatively, there is a book on Pickering's art called Mathematical form: John Pickering and the architecture of the inversion principle, published by the Architectural Association. News from the world of maths: Happy birthday, Leonhard Euler! Leonhard Euler, born on the 15th of April 1707 in Basel, Switzerland, would have turned 300 yesterday! In the current issue Plus kicks of a celebratory series of articles with Robin Wilson's "Read Euler, read Euler, he is the master of us all.". Here is a taster of Wilson's article. Euler was the most prolific mathematician of all time. He wrote more than 500 books and papers during his lifetime — about 800 pages per year — with an incredible 400 further publications appearing posthumously. His collected works and correspondence are still not completely published: they already fill over seventy large volumes, comprising tens of thousands of pages. Euler worked in an astonishing variety of areas, ranging from the very pure — the theory of numbers, the geometry of a circle and musical harmony — via such areas as infinite series, logarithms, the calculus and mechanics, to the practical — optics, astronomy, the motion of the Moon, the sailing of ships, and much else besides. Indeed, Euler originated so many ideas that his successors have been kept busy trying to follow them up ever since. Not surprisingly, many concepts are named after him: Euler's constant, Euler's polyhedron formula, the Euler line of a triangle, Euler's equations of motion, Eulerian graphs, Euler's pentagonal formula for partitions, and many others. Euler's career took him from his native Basel to the Academy at St Petersburg, where he eventually became Professor of Mathematics, to the Berlin Academy, on invitation from Prussia's Frederick the Great, and finally back to St Petersburg. He fathered thirteen children, of whom only five survived to adolescence, and reportedly carried out mathematical researches with a baby on his lap. On the 7th of September 1783, after amusing himself with calculating on a slate the laws of the ascending motion of air balloons, the recent discovery of which was then making a noise all over Europe, he dined with Mr Lexell and his family, talked of Herschel's planet (Uranus), and of the calculations which determine its orbit. A little after, he called his grandchild, and fell a playing with him as he drank tea, when suddenly the pipe, which he held in his hand, dropped from it, and he ceased to calculate and to breathe. 101 uses of a quadratic equation. The distinguished mathematician Paul Cohen sadly died on Friday the 23rd of March 2007, just a few days before his 73rd birthday. Cohen worked on a range of topics, but is best-known for his work on set theory. His work in this area cuts right down to the foundations of mathematics. The mathematician David Hilbert famously believed that it should be possible to phrase all of mathematics in a single and completely formal theory. Based on a collection of axioms — pre-determined facts that are so self-evident they do not themselves need to be proved — and the rules of logic, it should be possible to formally prove every mathematical truth and to arrive at a complete theory that is free from contradiction. Set theory provides a language in which such a formal system might be phrased. In maths a set is simply a collection of objects. The objects themselves are allowed to remain abstract and so you can talk about all mathematical objects — whether they are functions, numbers or anything else — in terms of sets. In the beginning of the twentieth century, mathematicians laid down a list of axioms and rules of logic that resulted in a formal and rigorous theory of sets. The system is known as ZF theory, after Ernst Zermelo and Abraham Fraenkel. On the face of it, sets are simple objects. But once you allow them to have an infinite number of elements, things become complicated. If you take the set of whole numbers, for example, and compare it to the set of all numbers, you'll notice that although both sets are infinite, they are fundamentally different from each other. The set of whole numbers consists of isolated objects, whereas you can think of all the numbers as merging together to give a continuum. In some sense, the set of all numbers is "bigger" than the set of whole numbers, so we need a notion of size for infinite sets also. The mathematician Georg Cantor (1845 - 1918) formalised such a notion, called cardinality, and in doing so came up with a conjecture that became known as the continuum hypothesis: that there is no set that is "larger" than the set of whole numbers and "smaller" than the set of all numbers. However, a proof of this fact illuded Cantor and the continuum hypothesis became the first on Hilbert's list of mathematical challenges for the 20th century. When it comes to the axioms of set theory, things aren't all that clear-cut either. Some axioms are clear as day, for example the one which states that two sets are the same if all their elements are the same. Others are more controversial though, and one of them is the axiom of choice. It states that if you have a collection of sets, then you can form a new set by picking one element from each. Again, this is clearly possible when you've got a finite collection of sets, but if there are infinitely many, it's not clear that a mechanism for picking an element from each always exists. Although the majority of mathematicians accept the axiom of choice, there is a school of thought which doubts it. Paul Cohen proved two significant — and to the Hilbert school of thought disappointing — results in this area. He showed that neither the continuum hypothesis nor the axiom of choice can be proved from the axioms of ZF theory. Together with results previously proved by Kurt Gödel, this means that neither can be proved to be either true or false within ZF theory. Within ZF theory, the continuum hypothesis will forever remain a mystery. As far as the axiom of choice is concerned, the result means that there's no clear indication as to whether you should include it or its negation as one of your initial axioms of set theory. In both cases you come up with a sound system, so the decision whether to include it or not has to be made on different grounds. In proving these results, Cohen not only contributed to the philosophical debate about the foundations of maths, but also developed a whole new set of tools to deal with questions on what can and cannot be proved within formal mathematical systems. His work was honoured with a Fields medal in 1966. The world of maths has lost one of its most distinguished members. We have recently come across a great range of career magazines for students and graduates from different backgrounds. KAL (for ethnic minority university students and graduates), Number Ten (for female university students and graduates), The Arberry Profile (for disabled university students and graduates), Spectrum (for ethnic minority secondary school students) and Mint (for female secondary school students) are produced by the people at Arberry Pink. Each magazine contains information about different areas of employment, with interviews with people working in these fields and information on employers. The latest issue of Spectrum has a feature on science and engineering, which talks to people from the British Antarctic Survey, a space mission scientist, and a geochemist. Also the magazines are all written and edited by a team of students, in collaboration with the staff at Arberry Pink. So if you are looking for experience in journalism why not consider getting involved?